Amazon’s(s amzn) smartphone could be an AT&T(s t) exclusive and come with a feature called “Prime Data”. The leaked information was published on Friday on the Boy Genius Report, which also provided some of the reported first looks of Amazon’s handset, expected to launch in September. What is Prime Data? That’s a good question, but if you think about Amazon’s business model, you can get an idea of what it might be. The company has long subsidized products in order to boost engagement on its shopping and services sites, hoping to spur more sales. The data feature would likely be some amount of mobile broadband included with the phone each month at no charge. It’s possible that Amazon could even add more data to a monthly account based on product purchases or Amazon Instant Video rentals. The idea isn’t too far-fetched and Amazon has provided free mobile internet service in the past. Think back to the Amazon Kindle and its internal 3G radio. Amazon doesn’t charge for that data connection when ordering books. The company even allows that data connection for limited browsing on the tablet. BGR also notes that Prime Data may be part of AT&T’s Sponsored Data plans, where a business could pay for consumer network access. Such plans could step on the toes of any net neutrality initiatives, but AT&T has said it will not prioritize traffic for the plans. In a case like this — where a plan is attached to a device already tied heavily to a content ecosystem — it may be beneficial for the consumer. Looks like AT&T building strong case for Sponsor data. *The answer is the HTC First. Indeed; I’m no fan of carrier exclusives by any means. If this does play out as we think though, it may be because AT&T is the only (AFAIK) carrier with the sponsored plan option at this time. If Amazon wants to subsidize some or all of the mobile broadband, this might be the easiest way for it do so. I supposed it could become an MVNO and buy network services wholesale from whomever but that’s a bit messy by comparison. 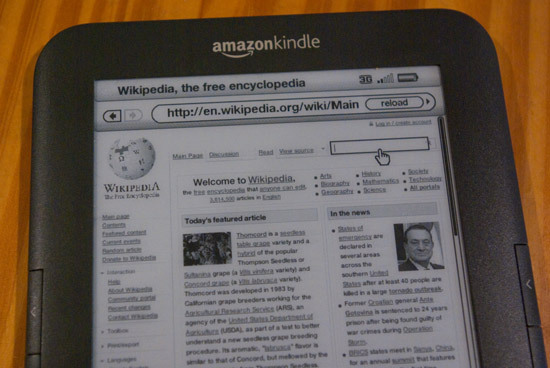 If they do go this route, I would like them to add web browsing abilities back into the 3G Kindle Paperwhite, as well.